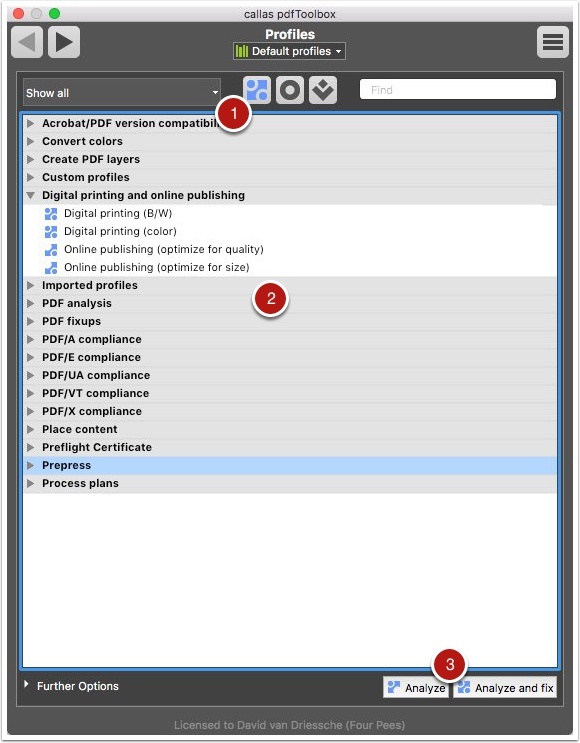 Profiles (also referred to as preflight profiles) are the corner stone of pdfToolbox. Read this article to understand what they are and what their possibilities and limitations are. When you look in the "Tools" menu in pdfToolbox Desktop, you'll see three menu items that will bring up the same window, albeit a different tab: "Profiles", "Checks" and "Fixups". The reason for this is that these three items are intimately connected. A check is a single thing you want to check in a PDF document. A check could detect the use of the Courier font, or low-resolution images, or a specific spot color, but in all cases it is a single thing you want to know about PDF documents. Checks never change your PDF document, they just look and report. A fixup is a single thing you want to fix (correct, change) in a PDF document. A fixup could do a color conversion, flatten transparencies or add a QR code, but it's always one thing you want to do to a PDF document. Fixups can change your PDF documents, but they won't always do. That depends on the fixup and the PDF document. A profile is a collection of checks and/or fixups. When you want to fix a number of problems in your PDF documents, and you want to check its quality, you build a profile and run it on your PDF documents. That will cause the fixups to do their work if necessary and it will run all checks to check the quality of your PDF documents. Let's look at all of this in a bit more detail. To see the list of checks in pdfToolbox, use the "Tools" > "Checks" menu item. This will open the profiles window, on the checks tab. The highlighted icon indicates we're looking at the "Checks" portion of the profiles window. The search field allows quickly finding a check. Simply begin typing and the list will be reduced to any check that contains your search term. The list of checks in this library; checks are always stored as part of a particular group. You can't choose these groups nor where a new check will appear; this is determined by pdfToolbox. 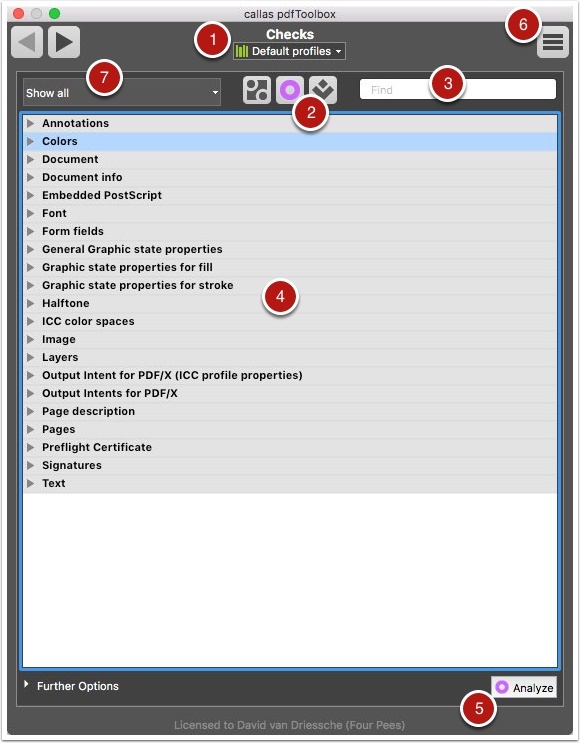 Once you have selected a check, the "Analyze" button allows running that check on the currently displayed PDF document. 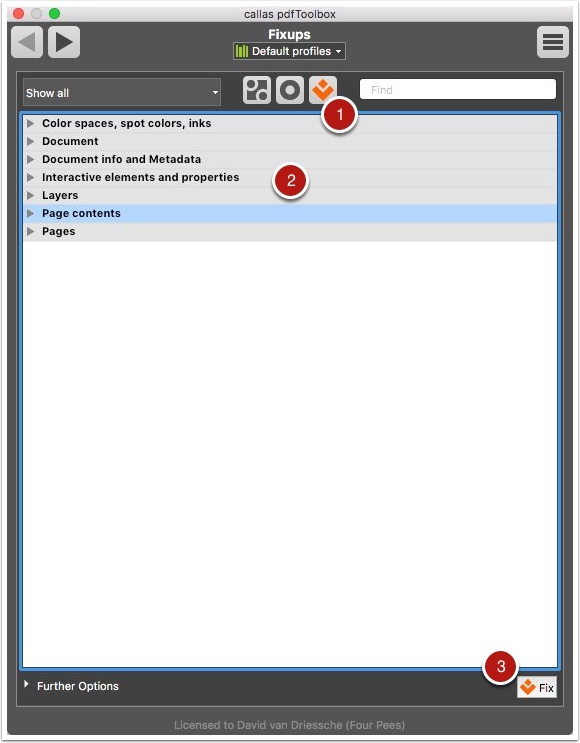 See more about running profiles in the article Processing PDF documents with profiles. The action button brings up a menu item with a number of potential actions you can take on a check. There are some filters that can reduce the view on profiles. Of course it's possible to edit existing checks or create your own. This would lead too far to explain in this introductory manual, please refer to the other pdfToolbox manuals in this online help. The fixup window can be reached by using the "Tools" > "Fixups" menu item or, if you already have the profile window open, by simply clicking on the icon on the right to select the list with fixups. The icon highlighted now is that of the fixups. The groups are different. It is still the case that each fixup appears in a particular group and that this is determined by pdfToolbox. You cannot customize this list. The button in the lower right corner is now called "Fix" and it will execute the selected fixup on the currently displayed PDF document. The profile window can be reached by using the "Tools" > "Profiles" menu item or, if you already have the profile window open, by simply clicking on the icon on the left to select the list with profiles. The icon highlighted now is that of the profiles. In this case the list is the list of profiles present in the current library. And unlike for checks or fixups, in the case of profiles you can indeed modify this list and sort profiles how you want to sort them. When you select a profile, there are two buttons that appear to execute the profile. See the article Processing PDF documents with profiles for more information on how to run profiles and what the difference is between these buttons.